In the Unicage development method, commands are seen as “parts” for writing shell scripts. These software “parts” exist at various sizes: function, class, module, package, command, etc.. Commands are the oldest among these, and therefore, are today regarded unconventional. Unicage uses less code then other development like Java, Cobol, etc. This significantly increases the sustainability of the code, ease of knowledge transfer and speed and agility to deploy. Unicage typically does not require variables in programming as it is able to directly reference data from its file structure. As a result this speeds up processing and reduces common memory errors and other scripting needed to call variables. It also makes it simpler for business user programmers who are not familiar with using variable. Unicage has about 50 core commands that are able to address just about every requirement needed for enterprise systems. For more complex issues, our engineers can introduce additional commands to tackle the most difficult calculations and instructions. This makes it very easy to remember as a developer or business user. We have not had to change these commands for years which results in stable applications in your eco-system. Unicage is efficient by design and method. We have demonstrated significant reduction in overhead and complexity at our clients who have seen dramatic improvements in speed, agility and sustainability of design. In fact, our code does not have common issues related to upgrading. As a low level language we are able to avoid the high cost and risk of upgrades, and updates or changes to business logic can be developed and deployed with out business interruption. A process implies an input/output of data. Data are files, and thus numerical data is both in a text format and is a text data itself. Several commands that perform file inputs/outputs exist. Programming therefore can be seen as the repetition of file inputs/outputs by commands. There is only a certain number of commands, and new commands are seldomly added. It is therefore essential to realize the entire desired process solely with commands. Shell variables are seldomly processed; values are usually stored in files and processed. In other words, it is rare that commands process input variables directly. Even with the same process, changing the method of command usage or its order can result in a large increase in efficiency. 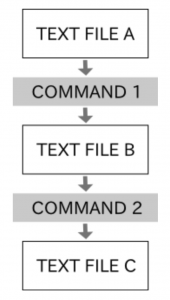 When using a command, it is necessary to be aware of the file’s physical size and sequence. Configurations of data and programs are fixed, so only basic documentation is necessary.